Celebrate with the Vallejo Watershed Alliance! 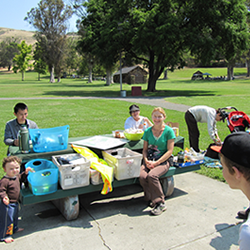 Every year, Alliance volunteers gather to celebrate the work of the year at Blue Rock Springs Park. You can spend an easy morning picking up trash around the lake (come at 9 a.m.); or just come for a burger or hotdog at 11:00 a.m. This is your party! If you come for the lake cleanup, wear comfortable clothes, sturdy shoes, hat, gloves and sunscreen. All volunteers welcome. Lunch is free, but PLEASE RSVP to (707) 654-1943 or email info@VallejoWatershedAlliance.org so we know how much food to prepare.